Katherine Ceasar-Spall moved to Maryland in 1991, where she performs with many of the ensembles in the Baltimore-Washington area. She is currently a core member of the National Philharmonic Orchestra and has been the principal oboist with the Alexandria Symphony since 1992. She was also a core member of the (now-defunct) Washington Chamber Symphony and has performed frequently with the Concert Artists of Baltimore, the National Symphony, and the Wolftrap Opera Company. 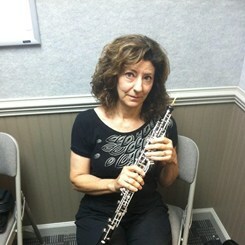 From 1986 to 1992, she played oboe and English horn for the Richmond (Virginia) Symphony Orchestra. A native of Detroit, Ms. Ceasar-Spall received a Masters Degree in Oboe Performance from the Manhattan School of Music, where Henry Schuman was her principal teacher. In the early 1980’s she lived in the Dominican Republic and Mexico, playing in orchestras and chamber ensembles, giving solo recitals, teaching and also playing jazz concerts and conducting jazz workshops (she is also an accomplished jazz flutist). In 1978, Ms. Ceasar-Spall toured Italy as a member of The Pastiche Wind Quintet, representing the city of Detroit in a cultural exchange between that city and Florence. She has performed at many summer festivals, including The Bach Aria Festival (New York), The Aspen Music Festival, The Grand Tetons summer festival, and the American Institute for Musical Studies (Graz, Austria). Ms. Ceasar-Spall is the author of Let’s Play Jazz (1983), a Spanish-English improvisation manual, published by Hansen House. She is also co-author with her husband, James Spall, of the paper “Regression Analysis as an Aid in Making Oboe Reeds,” which was presented at the American Statistical Association Annual Meeting, August 1994, Toronto, Canada, and featured as a cover story in the December 1994 issue of the Amstat News (monthly magazine of the American Statistical Association). The paper appears in the July 1997 issue of the Journal of Testing and Evaluation, as well as in the Fall, 1997 issue of The Double Reed. Because of interest in this paper, Ms. Ceasar-Spall was interviewed for an article that appeared in The New York Times in October of 1997. Request Lessons with Kathy today!